Den lilla versionen av den klassiska Pompadour. Passar utmärkt till ditt abborrefiske när du vill ha ett bete som går på ytan. Detta bete "crawlar" sig fram med sina två armar och en liten propeller bak på betet för att synas och höras ännu mer. Vill du ha mycket rörelse på ytan är detta betet perfekt! Micro version of the classic Pompadour surface lure with all the great characteristics that make it such a surprisingly deadly bait! This crawler imitates anything that might stray onto the surface film of the water. Could be an insect.. Or a small rodent or a frog.. Fitted with two side blades that create an alternating swimming style typical of a crawler. A small propeller at the rear gives off an attractive wake and a rattle increases the noise attraction. The Micro Pompadour has a weight transfer system to help with distance casting and the hook attachments keep hook pulls to a minimum. 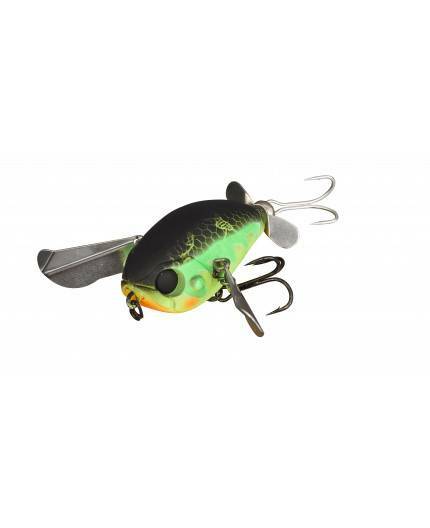 Great for black bass and pike, this mini-model is the perfect size for bigger perch that often hole up around structures. A lure guaranteed to get your pulse racing!